Gor Mahia have moved their match against Chemelil Sugar from Kisumu to Nakuru. This according Organizing secretary Judith Nyangi. “Our match against Chemo on Thursday in Nakuru will kick off at 2 pm live K24” said Nyangi. The reason is to reduce the amount of travel for the club before they play against Rayon Sports in a crucial CAF Confederations cup match on Sunday. However note that Afraha is one of the surfaces that coacg Dylan Kerr has often complained about, saying that the uneven surface is not conducive to good football and makes players prone to injury. This comes after KPL declined an appeal by coach Kerr to postpone the Chemelil game. “We are carrying Kenyan football for all of Africa to see but the importance of the game v Rayon and USM are paramount and yet we have 5 important games; 3 exceptionally important games in 14 days.” said Kerr. But KPL CEO Jack Oguda says it will not be possible to act now with any changes. “We cannot alter fixtures now because we also have a tight schedule. Furthermore, Gor Mahia have not written to us to complain. They have asked to play Chemelil in Kisumu and we cannot change the fixture now because of the rules.” Oguda said. It is not clear why KPL is in such a hurry to decide the league in August. Nor is it clear whether the club EC ever appealed to KPL over fixture congestion. Coach Dylan Kerr is fed up with Godfrey Walusimbi’s agent and has vowed to make him lose his license. Kerr went on to specify which FIFA rule Walusimbi had contravened. “His agent acted for financial greed and Kaizer Chiefs think they can get him for pennies but worst of all acted illegally against Caf and Fifa rules. Rule 18 clearly states that a club intending to conclude with a professional player must inform the players club in writing before entering into negotiations. “Walusimbi is contracted to Gor Mahia until 2020 and Chiefs have not written.” he concluded. Indeed if Kogalo don’t take action, this behaviour could become the new normal. JOHANNESBURG – Kaizer Chiefs football manager Bobby Motaung has confirmed that Godfrey Walusimbi, the subject of accusations that Amakhosi are guilty of player tapping, is indeed in Naturena to negotiate a deal to join the Glamour Boys. But Motaung was quick to refute reports that the South African giants are trying to lure the Ugandan defender away from his Kenyan club Gor Mahia without their permission. Tapping is illegal according to Fifa rules. The Gor Mahia chairman even claimed in a statement that his Amakhosi counterpart had phoned him to apologise for getting off on the wrong foot. “It’s unfortunate that a player can just decide on his own to travel to engage another club without our knowledge. “I got an alert from someone that he was travelling, and the next thing was a call from the Kaizer Chiefs chairman apologising for that step, and requesting if we could talk on a possible move,” the statement from two days ago read. Breaking Chiefs’ silence on the matter, Motaung said the Amakhosi were following protocol in trying to sign Walusimbi. “He is here at the village (club headquarters), and we are going about things the right way. We will make further announcements when we have agreed a deal with his club. “But the player has not gone missing from his club. Maybe there was some confusion as the coach (Dylan Kerr) obviously wants to keep the player,” Motaung explained. Walusimbi still has at least a year remaining on his contract with Gor Mahia, according to reports in Kenya, and has been valued at R3 million. Chiefs were last month accused of signing a player that is still under contract by Fosa Juniors, a club from Madagascar. Andriamirado “Dax” Andrianarimanana denied being their player, while Fosa were adamant he was contracted until 2020.
oh my… how the honorable carry out business. And that gentlemen is how sugar ships itself from Brazil to Kenya. woud Asego, once a mistake, twice nooo! hiyo ni madharau, let him feel the pain, but trust me he will regret this, chien ok yan, you may need it later, respect is Paramount walu walu was my favourite, but his actions God forbid, tho oola. Jasego , if this walu issue is not dealt with correctly, many more will keep sneaking out. I hole some next weeks games will be postponed. Common sense would reason that since the CAF matches against Rayon and USMA are very crucial, everyone in the national football administration would prioritize them. That is the best practice everywhere around us. I believe that KPL are among the beneficiaries of any financial fruits that K’Ogalo’s CAF campaign yields. Some Jack Oguda and his ilk who therefore become impervious to reason must just be doing so out of some evil motive. Perhaps Gor Mahia EC and Tech Bench could sacrifice the league matches that Oguda has adamantly refused to reschedule. We should train our sights on the CAF games and give walk-overs to Sofapaka and Efusi since these are inconsequential matches, that if anything will just compromise our output in the CAF matches. Kaizer Chiefs apparently are not committing this offense for the first time. They have a history to suggest that they are a wily, sly and dirty player. Apparently their modus operandi is to identify the weakness of an official of their target club and then blackmail that official to force the club to come to the negotiating table. The confidence and arrogance that they are displaying now is a pointer that KC has a firm grip on Rachier’s kanyandguogi and therefore, however much noise Rachier may make, eventually he will have to drag Gor Mahia to the table to negotiate over Walusimbi. Should Rachier fail to play ball, then KC will open Rachier’s closet and skeletons will fly all over the place. Which leader in his right senses would allow that? Gor Mahia head coach Dylan Kerr says his team’s style of play can be likened to that if Arsenal and Manchester City. K’Ogalo has been excellent in most of the aspects this season, hand are on the verge of qualifying for the quarter-finals of Caf Confederation Cup. The tactician is however, cautious with his charges, who he feels have played many games in a very short time. “Watching Man City v Arsenal on Sunday, I saw a likeness to how we play but recently the toil of games and extensive travel means we are not the same but I give credit to my players, they have desire passion to always give their best. “We have not had time to play friendly games or get the match sharpness because of our congested fixtures unlike our competitors. It is hurting all of us but we must be proud to be Gor Mahia for what we have done. We haven’t achieved anything yet so we will keep doing what we can,” Kerr told Goal. 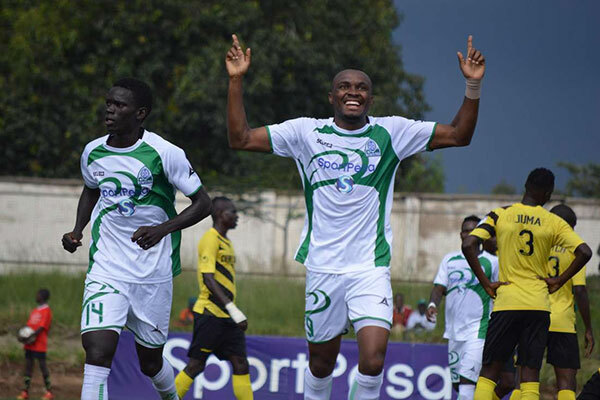 Gor Mahia will next face Chemelil Sugar on Thursday, its third game in a week, before facing Rayon Sports on Sunday in the Caf Confederation Cup. I hope I am wrong, but I think the Wesley Onguso in K’Ogalo is a far cry from the Onguso that played in South Sudan in 2014 – 2016. He is one player who is capable and should give more. Gor Mahia Head Coach Dylan Kerr has reitarrated that the team’s winger Innocent Wafula will not leave the club to join Ugandan side Vipers SC. Media Reports in Uganda indicate Vipers is close to signing the player having agreed terms but Kerr says the player is still contracted to Gor and will not leave. “Wafula is contracted to Gor Mahia and he is our player. He is an important member of the squad and going nowhere.” He concluded. Wafula’s contract with the reigning Kenyan Premier League (KPL) champions lapses in January 2019.
of ksh 10m by an ‘insider” , and I repeat what I said then , that there are people who are strategically placed in various social media sites to test the waters for an impending scandal. Gor Mahia have the kc balls on this issue and to imagine that they may squander this leverage by going on the cheap for 10m for a player worth over 20m when they can use this tapping leverage to even get 30m is very suspicious to the extreme and we have to be alert on this . Personally am not in agreement with this idea of Walusimbi coming back to the team , enough of those Judas kisses from him , let him go but let KC pay through the nose for their disrespect , its either that or severe sanctions from fifa. It is not advisable that Walusimbi stays at Gor, but the correct thing must be done. I believe that this was a ‘magendo’ move gone bad… someone in Gor was part of this scam. Gor EC must correct this wrong. The deal must be rejected by the EC. KC must be forced to face Fifa disciplinary. Walusimbi is a favourite player in Gor but he must be taught what the word professional means. 1. Walusimbi can come back, apologize and finish his term. 2. He can decide to remain big headed, I too would support Gor going hard on him, sit on the bench for the rest of your term if need be. 3. KC MUST be taken to the Fifa court-house. This so called forceful quitting by players has been encouraged corrupt and inept EC. Get rid of these “warm up” contracts! Gor must set an example or forget calling itself a big club. KC would not have done this with Esperance or Wydad Casablanca. These are big clubs. They do not handle matters Jua kali style. KC did this to Gor out of contempt. Why should Gor settle for kshs 10mill (Koinange street deal) if it is a big club. A player an only go if the contract has runitd course or if the buying club pays the agreed transfer fee, period. In the Absence of any of the two above then the Club holds the right to discipline the player for abandoning duty. Martial of Man Untd despite all the push and shove had to come back to Man Utd. and pay the fine. Walusimbi has a running contract and it’s Gor Mahia to negotiate with Kaizer Chiefs (they must be willing to sell) before Walusimbi can negotiate with the Southern Africa Club. A player cannot force a Club to negotiate, just the same way, a Club can not sell a player with s running contract against his will. Read Adebayor’s case at Tottenham and Malouda’s case at Chelsea!!!!!! @ joshua…..breakdown of the monday evening deal that was submitted as follows…..
However,amakhosi are yet to respond so we await breaking news ! Jackie please tell Gor Mahia EC to stop ‘cheapening’ the club. Word from South Africa has it that Walusimbi is valued at 3 million Rand which is an equivalent of KES 21 million. EC should therefore not negotiate anything below KES 21 million. Kindly tell them that that is the position of Gor Mahia Bloggers’ Branch. This was a process based on theft, you cannot get the correct price. The value you quote is when if the deal would have been done correctly. Exactly what KC were avoiding. This was theft from the word go. So now Gor Mahia can impose a ‘fine’. Corruption has away of coming up with all sort of excuses. But all the same corruption has won. Why should KC pay this fine(bribe)? What is the amount the thief stationed at Gor going paying? If I was KC I wouldn’t give more than 2mill. To EC and your homeguards… congrats. Any local tv station broadcasting this match live? Updates of GM vs Chemelil match? Gor look ordinary. Nothing exiting. Guikan on ambulance with injury. The injury on Guikan looks nasty. Hope all goes well. Game now open. Chemelil out to get draw. Accuracy poor from both sides. Gor has the better possession. Chemelil in rush open for counter.